QuickDate is a dating social script, QuickDate is the best way to start your own dating website! QuickDate is fast, secured, and it will be regularly updated. Do you have any questions? please read our FAQs. DeepSound is a music sharing script, DeepSound is the best way to start your own music website! DeepSound is fast, rich, secured, and it will be regularly updated. Check the how to use script videos from here. The script works on shared, VPS and dedicated hosting plans just check if your hosting company meets the script system requirements listed here. Also, you can find a list of recommended shared hosting companies here. Easliy translate PressFly to the language of your choice. You can add unlimited categories with the ability to edit and delete. You can add unlimited tags with the ability to edit and delete. You can add unlimited posts with the ability to edit and delete. You can add unlimited pages with the ability to edit and delete. NOTE: This is the only OFFICIAL null on the internet, don't settle for other scripts. They could delete important files, or causepermanent damage to your online reputation. This version is certified by the DoniaWeB community. Purchase code and all apps nulled. All calls to external servers removed, and most importantly, the backdoor was removed from the script. Script authors have no way of knowing you use a nulled version. WoWonder is a PHP Social Network Script, WoWonder is the best way to start your own social network website! WoWonder is fast, secured, and it will be regularly updated. With support for automatic thumbnails & image resizing in over 200 image formats, robust privacy options, secure image manager, external storage a feature rich admin area and free migration scripts, Reservo really does tick every box. Automatic thumbnail previews, transfer speed and time remaining. The uploader handles large uploads in a breeze and doesn't rely on Flash, so it works on all devices. Slick, modern & fast image manager. Built from the ground up, it supports multiple level albums, passwords and privacy options. Choose to run a premium image hosting service like Flickr. Earn money from advertising or by selling paid account upgrades with additional storage. Have full control over your website! Manage images, user accounts, track payments, website settings, themes, plugins, translations, all in your dedicated admin area. Built on code which is tested in over 3,000 websites and tested for XSS & SQL injection on every release, you can be sure your website is secure from external attack. We supply you with 100% of the source code, not 1 part of it is encoded! Make all the changes you need to the styling & core functions without being limited. Stackposts is a social media marketing tool that allows and helps you to easily auto post, schedule Instagram posts along with Facebook, Twitter and many more!. It also can manage multiple social networks, schedule posts, increase your Traffic and engage your audiences. Just upload the media you want to post, type up your caption, and use the handy calendar to decide when you’d like your post to go out. Pretty, is a theme for WoWonder Social PHP Script. To have this theme, first you must have WoWonder Script. NEWS FEED – The News Feed page keeps you up to date with the latest status updates of your friends, birthdays and activities, shows friends suggestions and more. PROFILES – The Profile page features cover and profile images, information about the user, friends list, liked messages, visited locations as well as the user’s timeline. GROUPS – With Groups you can create and manage communities, stay in touch with the members, share statuses, get notifications when something is posted. PAGES – With pages you can create pages to promote your brand, community, company, etc. as well as keeping your fan base up to date with your activity. MESSAGES – Share your life moments, photos, music, videos, movies, places, visited locations, with the public, your friends or privately. LIVE CHAT – Communicate with your friends in real-time with our multi-windows chat, share your thoughts, photos, emojis, take camera shots and more. SEARCH – Instant search allows searching for People, #Hashtags, @Pages and !Groups, the results can be filtered using various parameters to match your needs. NOTIFICATIONS – The advanced notifications system keeps you up to date with the activity of your friends, get notified on Likes, Comments, Shares, Group Invites, and more. CONNECT – Your users can easily register and log-in on your website with a simplified registered form. Facebook integration also allows to quickly connect with just two clicks. Uploadaty is a professional script to earn money from uploading and sharing files. We guarantee our customers the quality and profits of this profitable project. Uploadaty script can be installed on any hosting (with unlimited upload space because the script is dedicated to upload files so it will need unlimited space). 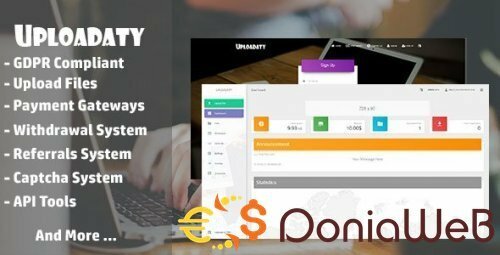 Uploadaty referral program is a great way to spread the word of this great service and to earn even more money with your uploaded files! Refer friends and receive 20% of their earnings for life! Easliy translate Uploadaty to the language of your choice. Visitors can choose ftheir language from the dropdown. With Powerful Exchange System PRO you can create your own social exchange system wich will bring social media to a new level (we're not affiliated or endorsed by any of those social networks). Demo contains all available modules and languag packs, but some of them are paid modules and are not included by default with the script. You can find them at "Related Products" tab. Ability to enable / disable the module. Check the link Upload / delete media files from s3 cloud. Once you enable this module all the files are uploaded to amazaon s3. This module can be disabled or enabled anytime from admin panel. If the module is disabled then automatically all the media files are uploaded on local server, and don’t worry all the files are uploaded on s3 are available on site. Where they can place orders, see orders history, add funds to balance, submit support tickets, etc. Seamlessly integrates with PayPal, Skrill, WebMoney, Perfect Money, Payza, Bitcoin, etc. Connect any APIs for forwarding automated orders processing or manage orders manually via admin dashboard. Set any currency. Change site language. Chose theme. Edit content, menu, SEO attributes and other options. Easy-to-integrate API for your customers,So they can forward orders to you. Manage users, services, orders, tickets. Configure automation. Review stats. And many more. English, Spanish, German, Russian, Chinese, Arabic and more… Any language you need easily can be added. Script is Built in mind that every person have a different test of color and theme, select different colors out of the box. Once PHPTRAVELS installed, no programming skills are required to manage settings. Further down is a list of features supported by the our software. PHPTRAVELS has completely inbuilt and automated modules which are specific for online travel business. PHPTRAVELS has been meticulously designed for owners of hotels, tours, vacations, car rental, cruises, travel agencies, restaurants, apartments, villas, bungalows and rooms which are given out for online bookings. PHPTRAVELS comes with packs in many essential features which are editable Please scroll down and read all major features. Complete Booking Engine Billing, Reports and Invoicing System Modules Based Functions For each Section Build by PHP Codeigniter Framework 100% Customizable and Robust Application Developed by Professionals of Travel Business Test Drive The Application in Realtime! Crea8social is the leading social network software packed with amazing and customizable features. A wide range of available settings allows you to configure the system to suit your needs. You may also easily disable features you do not need. With this module you can allow your PES Pro users to exchange views for shortened links like adf.ly or other shortening URL's websites. FLAME is a PHP Social Media Script, FLAME is the best way to start your own social media, news website ! FLAME is fast, secured, and it will be regularly updated. Instagram was intended to enable clients to catch occasions as they come to pass and stay refreshed with their companions, family, and clients. Constant posting might be the most ideal approach to utilize it, however not every person has the advantage of the time to refresh their Instagram account continuously. There are a few instruments that enable you to transfer recordings and photographs, yet they don’t give you a chance to plan your substance. With Nextpost, you don’t have to stress over dealing with a few Instagram records and posting content. Top Kogao Funktionen Die Top-Funktionen für Ihre Kunden sind das aufgeben von Anzeigen, sowie verwalten der Anzeigen, das auswählen von einer Hauptkategorie und bis zu 3 weiteren Unterkategorien. Ihr System für Privat und Gewerbliche anbieten. Geben Sie Ihre Kunden die Möglichkeit Ihre Anzeigen vorzuheben mit der Galerie, Highlight-Anzeigen und Hochschiebe Funktionen. Alle Funktionen anzeigen Kogao Administrator Kontrollieren Sie Ihre System-Einstellungen, verwalten Sie die Kategorien mit dem Kategorie-Manager. Verwalten Sie Ihre angebotenen Zahlungsmethoden für Ihre Kunden. Verwalten Sie zusätzlich Anzeigen, Mitglieder, Anzeige-Meldungen, partnerlinks und Unterseiten. Informieren Sie Ihre Kunden mit dem Newsletter-Rundmail System. Administratoren Funktionen anzeigen Top Kogao Erweiterungen Erweitern Sie Ihr System mit dem Instant Nachrichten System, PDF-Abrechnungssystem, Automarkt Erweiterung, Immobilien Erweiterung, Beobachtungskarten System, Support und dem EAN Scan Erweiterung. Weitere Informationen Zusätzliche Dienstleistungen Sie erhalten zusätzliche Dienstleistungen wie kostenlose Software-Updates, kostenlosen Kontakt zu unseren Software-Entwicklern und Designern. Zudem erhalten Sie einen persönlichen Kunden-Center Zugang. Sowohl auch für das Ask-Center. Sie können jederzeit uns eine Anfrage senden bezüglich Weiterentwicklung Ihrer Plattform. NextPost All Modules And Skin Nulled – Instagram was intended to enable clients to catch occasions as they come to pass and stay refreshed with their companions, family, and clients. Constant posting might be the most ideal approach to utilize it, however not every person has the advantage of the time to refresh their Instagram account continuously. There are a few instruments that enable you to transfer recordings and photographs, yet they don’t give you a chance to plan your substance. With NextPost 32 Modules And 5 Skin , you don’t have to stress over dealing with a few Instagram records and posting content. Start your own streaming website now! Get Your Automated Movie & TV Show Site Today! We offer amazing support from our team. We fix any issues with the TVStreamCMS you may have. Paid Plan users will get direct support from our staff. Free users can use the forum for additional support.